Mindful Monday – Stop talking, be silent and listen! As many of you know, I’ve been sick for just about two weeks now. I went from having stomach issues to a full-on head cold that feels like it could very well be a sinus infection at this point (that’s probably me just feeling like all sorts of crap, because doctors won’t diagnose that for at least a week, and I’m a few days short…) Needless to say, my exercise schedule that I was so excited about has come to a screeching halt. I’m not one of those people who exercise through illness, although I know there are people out there who do. When I’m sick, all I want are sweats, a blanket and a nice soft couch to lay my head down. I can’t even begin to imagine going to the gym or running right now, but that doesn’t stop me from wanting to and missing the hell out of it. So, without any kind of updates on exercising, I was thinking about what to write that was interesting and fit the theme and I realized I’ve been thinking a lot about communication lately. I went from a relatively silent household growing up to learning that you need to talk about everything; talk it out no matter what! As an adult, I always felt that communication was important, and I’ve had an almost unhealthy aversion to silence, by which I mean lack of communication. It’s only been relatively recently that I realized you can get to a point where no matter how much talking you do, things can get much worse rather than better. And sometimes it is because you’re talking that it degenerates into something worse. I found myself looking for a certain something when talking to my fiance. I wanted him to respond in a certain way or I wanted a resolution. But I was so busy talking, I didn’t even realize when he actually said what I needed, just maybe not in the exact way I was looking for. That’s not to say that we should stop talking; no, I believe it means we should each say how we feel and then stop. If you think about it, whatever it is only needs to be said once and then it’s okay to let it go. If it needs revisiting later, it will reveal itself (hopefully). Because sometimes the more you talk about something, the more you realize you are repeating the exact same things over and over again expecting different results. After all, the only person you can change is yourself, and expecting someone to do or say something to make you feel better is an exercise in madness. I suppose the biggest thing I’ve learned in the past few weeks is that silence and listening are parts of communication, maybe even bigger parts than actually talking (yep, and it only took 40 years…). I’m not sure if I helped any of you, but it sure helped me to put those thoughts into words. Happy Monday everyone! May you find peace and light in whatever you are doing. 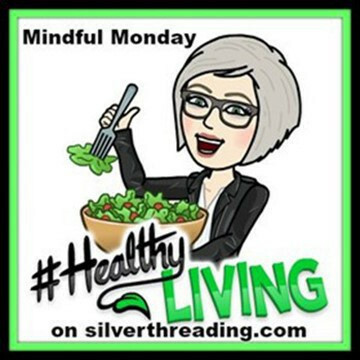 This post is part of Mindful Monday hosted by Colleen at Silver Threading. Intelligent words! Now if only someone is listening . . .
What a wonderful article. Loved your take on it. Repeating what you said can cause friction in a relationship.